Similar flowers can be arranged into beautiful arrangements — or not. As you can see the arrangement has “bullseye” flowers, but the filler isn’t recessed to show off those main flowers and little or no greenery has been added. This is an example of a badly organized arrangement. The Rutland Garden Club provides a social framework for the sharing of information and ideas on gardening and floral design. Through the 23+ community gardens that they have designed, planted and maintained, garden therapy projects and flower shows, the club helps beautify the Rutland area and stimulate the public’s interest in all phases of gardening. This is the time of year when we begin enjoying our gardens and want to bring in flowers to arrange in our homes. 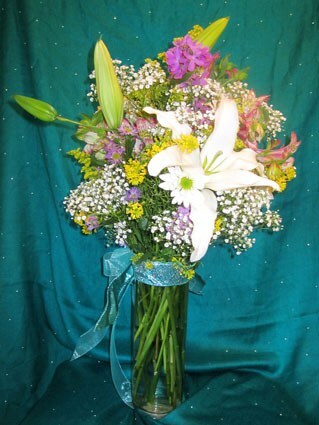 Here are some general tips that may help you create professional looking arrangements. When cutting fresh flowers from your garden, it is best to do so in the early morning or evening. Avoid cutting flowers in the heat of the day. Cut flowers on an angle as more water is absorbed. Split the stems of woody flowers, such as lilac so that they absorb more water. After cutting and before arranging, set the flowers in a cool spot for several hours or overnight to condition them. Conditioning means that they will drink up the water and give them longer life in the arrangement. Remove leaves below the water level as bacteria will form from them. When arranging, add flower food preservative packets to the vase water as they prolong the life of the flowers. When using an oasis (green flower foam) for your arrangement, cut it so that approximately two inches is above the top edge of the container. This allows you to place some flowers and foliages at an angle so that they come down over the edge of the vase. When creating a centerpiece arrangement, keep the height of the flowers lower than the measurement between your elbow and your wrist (approximately 10 inches) so that those sitting across the table can see over it. When arranging flowers for a party, give yourself time to enjoy the process. Don’t try to create a centerpiece right before the party. If possible, do it the night before and store the arrangement in a cool dark place until you need it. Enjoy this impermanent art form! The Rutland Garden Club is celebrating 100 years as a non profit civic organization and will present A Standard Flower Show entitled “Songs of the Seasons.” The show will be held at the Vermont Marble Museum located at 52 Main Street in Proctor on Saturday, May 30, from 12:30-5 p.m. and Sunday, May 31, from 10 a.m. – 4 p.m.
Division I will feature judged floral designs including a Functional Table Design Breakfast Tray, an Illuminary Class, a Small Design Class, a Freedom of Style Class and an Underwater Challenge Class. Division II will feature well over 100 judged horticulture exhibits including Classes on Perennials, Hosta leaves, and Branches to name a few. Division III will include Special Exhibits on Bees and another on Vermont Endangered and Invasive plants. Join us to view the first Rutland Garden Club Standard Flower Show since 2000 and at the same time view Vermont’s unique Marble Museum. The public is invited and the Cafe will be open. Admission to the museum is $5 for seniors and $7 adults. For more information www.vermont-marble.com.